The Old Gordon Cutoff trail is located in the BLM's Bangs Canyon Management Area near Grand Junction, Colorado. The trail serves as a connecting route between the Colorado National Monuments Old Gordon trail and the Upper Ribbon trail trailhead on Little Park Road. The trail begins at the west end of the Ribbon trail parking area. People tend to hike in all directions from this point. That makes for lots of side trails that can be confusing to navigate. The Old Gordon Cutoff trail doesn't have any trail markers so set your sites on this hill that looks like at may have been a jeep trail at one time. A vast expanse of slickrock opens up at the top of the hill. Find your way around the small canyon on the right and head in a more northerly direction. Follow the faint trail and stay to the left of the next section of slickrock. Find your way off of the small hill and pick up the monuments fence line and begin following it to the west. The trail along the fence line is easy to follow. There is at least one tree that gets in the way but is easy to get around. The fence is sagging where the Old Gordon trail ends on the National Monument side. That may be from hikers stepping over it or from the countless deer that pass through the area. 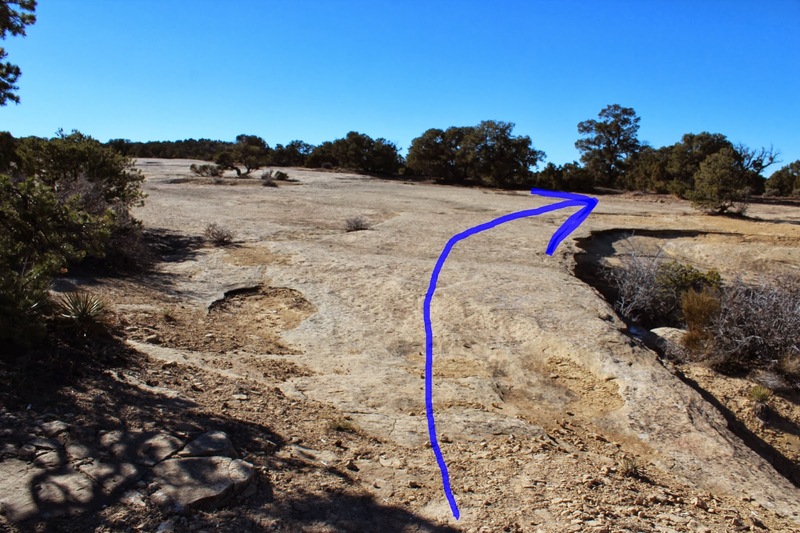 We have seen herds of deer that migrate from the Pinon Mesa area cross through here on their way to the lower Glade Park area with mountain lion tracks following closely behind. From here you can hike down the Old Gordon trail to the Devils Kitchen trailhead or just explore the upper section of the Old Gordon trail. Of course, since you will be hiking in the Colorado National Monument if you cross the fence you won't be able to take a dog with you. There aren't any signs that refer to this route as the Old Gordon Cutoff trail and it won't appear on any maps except the one that we made. Other hikers have asked us whether there was a route that leads from the Old Gordon trail to Little Park Road. The original route that the Old Gordon trail followed now leads across private property before it gets to Little Park Road. There are several places where you can find your way from the Old Gordon trail to the Ribbon trailhead but they don't allow you to hike all of the Old Gordon trail. This is the easiest and most direct route and we have dubbed it the Old Gordon Cutoff trail. If you would like to see it for yourself then all you have to do is 'Take a hike'.